Free download latest version of SpyShelter Personal Free. 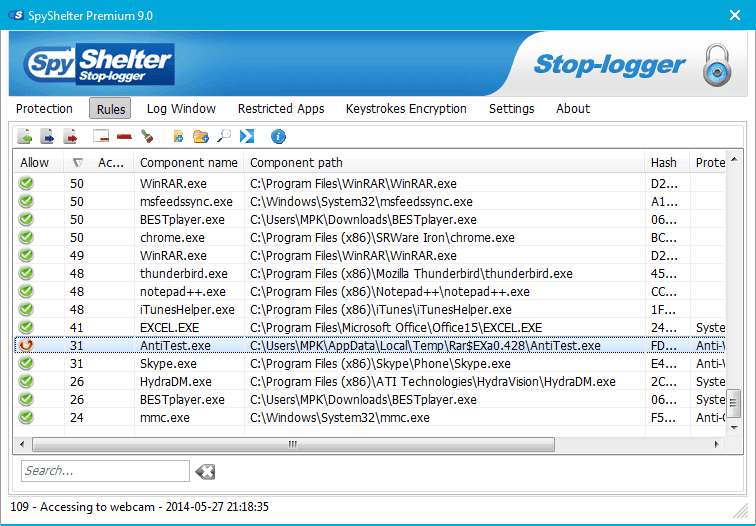 SpyShelter Free offers complex system protection and anti-keylogging modules for free, only for 32 bit systems users. It does not even require account registration! SpyShelter does not rely on an antivirus signature database, because our software understands how malware works. SpyShelter protects you from both known and uknown threats, which were not discovered by antivirus labs yet. Fast algorithm processing does not slow down your computer while scanning for dangerous elements. In fact, SpyShelter’s proactive defense is so light, that you will not experience any difference in your PC performance. SpyShelter guards your registry, physical memory (RAM) and other sensitive computer parts among with processes, so that malicious code cannot be injected to take control of your PC. SpyShelter ensures that whatever you type into your computer, is protected against dangerous people who want to steal your data! With SpyShelter, your personal data will be safe. SpyShelter shields sensitive data that can be found in your Windows clipboard as a result of copying, cutting, and pasting. Spyshelter ensures that this information will not be maliciously monitored by other people. Screen loggers might reveal sensitive data you enter on your computer, such as credit card information. SpyShelter will immediately stop all suspicious screenshot capturing activities.